It has been a little while since my last update, but I have been stuck deep down in the word mines. I’m just emerging now for a quick breath before I head back in again. Last night I hit 30,000, and I am pretty happy about that. My word progress is coming along. I wanted to stay ahead, for the odd day where I couldn’t write. And since I have recently become a Jamberry consultant, I have had a day or two where I have been focusing on that. Tonight I am heading out to our third official NaNoWrimo write-in. I love them! There’s nothing to do but sit and write, no distractions. Usually at this point in the month, the words are slower coming. It is like trudging through sludge. In the beginning we had a fresh, brand new idea that we couldn’t wait to start. Now we are trying to muddle through the middle. Figure out where we want our novel to go. How it is going to get to the ending we want. Or handle characters that have gone rouge and are doing things you didn’t plan or expect. But keep going. No matter how hard this part seems, don’t give up. We’ve got this. Grab your coffee. Go hide. You can do this! This week has been crazy with NaNoWriMo. I had hoped to get to the 25k mark by tonight, but I’m just over 20k, which I am pretty proud of. My brain is slightly becoming numb so I thought that since I am ahead of things, today would be a good day to take a break and recharge. I decided that my new goal for the half way mark will be Tuesday evening. I am pretty confident that I can do it, since I’m not that far off. In the meantime, my overworked brain is thanking me for the day off. I started the morning off by going for a walk and getting an iced coffee. And then once I was back home, I indulged in things I haven’t done all week. I caught up on my fave websites, played a video game, and then decided to make some happy mail. 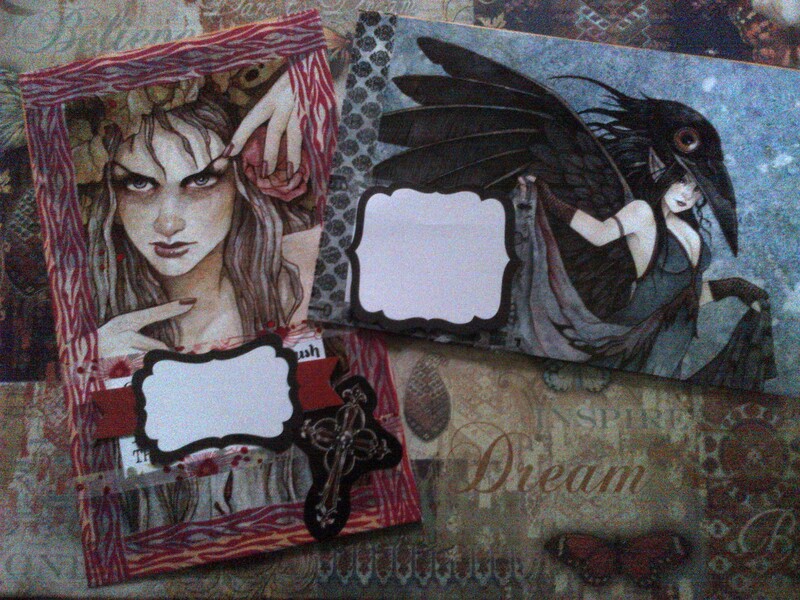 So far this morning I have made two envelopes, using an old calender, some stickers and washi tape. The one on the left will be traveling to The Netherlands once i get the time to sit and write her. The one on the right is a surprise for a friend in the USA. I love being crafty and creative and I am jealous when I see other people create art. There are many talented people out there, no matter if it is writing or scrapbooking, and I often wish I had their talent. But I don’t let that stop me from doing the things I love. I’m having fun, so that’s the main thing. And once in awhile I create a piece of gold I’m beyond happy with. I’m going to step away from the computer for awhile, do coffee with friends before I watch this week’s episode of The Walking Dead. And if I can manage it, I plan on putting my nose in a good book for a little while. So, what do you do when you take writing breaks? How do you recharge during Nano?